You must have picked a niche for your website by the time you are reading this tutorial. 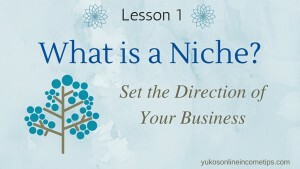 If you haven’t picked one yet, please go through the previous lesson first: What is a Niche? Ok, now is almost the time to launch your very first website. But before attempting to build a website, let’s have two things ready: Website title and domain name. Why? Because they are the information you have to type in as you create a website, so it’s better to have them in place prior to proceeding to the site builder. 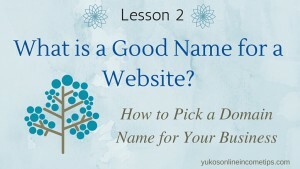 In this post, I’ll explain what makes a good name for a website (and domain name). Your site name (title) is most likely going to be your domain name too. The two do not need to always match, but it’s better if they do for marketing your business down the road. Let me touch base for those who don’t know what a domain name is. A Domain name is what you see in the URL bar when you visit a website. For instance, when you visit Amazon, “amazon.com” is their domain name. It’s like an address that takes you to the homepage of the site. The most popular ones are with dot com (.com) and others could be with dot org (.org), dot net (.net) etc. Choosing a good site name (hopefully, matching with the domain name) is vital to branding your business. It must be relevant to your niche and easy to remember. So, I want you to take some time to brainstorm and create one that you are truly happy with. Take this site of mine as an example. I was lucky that my site title was also available as a domain name with dot com. 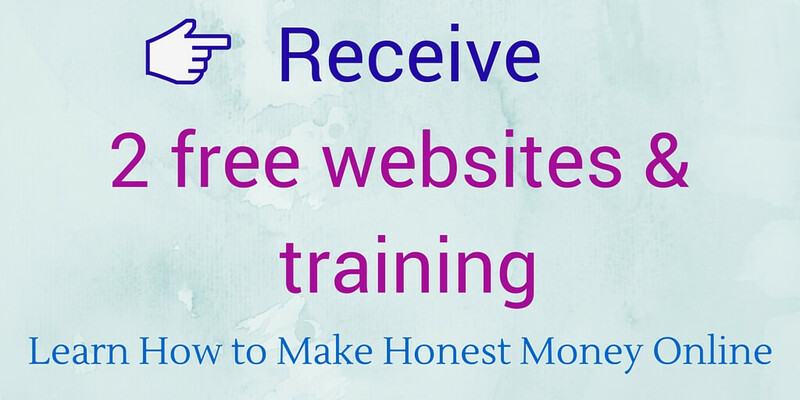 To tell the truth, though, “Yuko’s Online Income Tips” was not the name I first came up with. It was something else in the beginning. As a newbie, I didn’t fully understand the importance of having a memorable and brandable name, so I named this site with some lengthy phrase: “how to make money online safe no scams” or something like that. Eventually, I realized the need to change the name of my website (plus domain name) and I did. The transition was smooth thanks to the support team at Wealthy Affiliate University, but if you could avoid the detour I took, you should. Ok, from here, I’ll walk you through the process with the example of my new site. As I shared in the previous blog, I decided to launch a new website about Himalayan salt. What makes a good name for this brand new site on Himalayan salt? What names are already taken by others? Right here, you will see how I came up with a name for my new website. When people hear the name of my website, they should be able to easily guess what my site is about, which is Himalayan salt. I will be covering Himalayan cooking salt, salt lamps, candle holders and overall benefits of this natural product by Mother Earth. What title would be relevant? At this stage, jot down any phrases that come to your mind. Later in the process, you have a chance to check their effectiveness one by one. I ended up with a list of 10-12 terms and phrases at the moment. STEP 2. Do They Satisfy The Checkpoints? Then I started checking each one of them in the respect of the following factors. I eliminated any candidates that didn’t meet all four checkpoints below. Checkpoint 1: Easy to remember – You don’t want a name that no one can ever remember to tell their friends. Don’t estimate the power of word-of-mouth for marketing your business. Avoid uncommon words, and keep the name short. Checkpoint 2: Easy to type – Avoid hyphens, special characters, Roman numerals, and lengthy words. If possible, I would suggest avoiding numbers too, as it tends to perform poorly with both ranking in Google and branding. Checkpoint 3: Grammatical – It must make perfect sense semantically. Check spelling, missing articles (“a” or “the”), plural or singular, etc. Checkpoint 4: Unique – Do not include an already established brand name. It can get your website confused with other famous sites. If you are unsure, use the phrase in a Google search and see if any authority sites turn out. At this point, my list was reduced to 8 candidates. STEP 3: Are They Good Keywords? If possible, your site name (and domain) should contain keywords relevant to your niche. Keywords are the words or phrases that people type in the Google search bar to perform online searches. If someone wants to find out what Himalayan salt is good for and type in “what are the health benefits of himalayan salt,” then the phrase is the keywords. If I have written a blog on the topic and included the exact phrase within the text or used it as a blog title, my page may appear in someone’s search results. That’s how people discover your website. We call those visitors, “organic traffic,” who come visit our sites through online searches. It’s going to be a huge part of your website success and this is why online entrepreneurs make a big fuss about keywords. Generally, the longer the phrase is, the better it performs as keywords. They are called long-tail keywords, and more likely have less competition, hence result in higher rankings of your articles in Google. However, “what are the health benefits of himalayan salt” is neither proper as a site name (too long, too hard to remember) nor really relevant to my niche for the entire website. So, I’ll stick to the list and check how effective each one will be as keywords. You need a reliable tool to check keyword scores. I use a tool called Jaaxy. Not to overwhelm you with all the data, below I’ll share only the score of each phrase (out of 100 points). I thought “Pink Himalayan Salt” sounds perfect as it is exactly what my new site is all about. However, the term is hopeless as keywords. Only 8 points out of 100 points? Why so low? After all, it might be better to drop the word “Himalayan” from the title. Many people may not even know the pink-colored salt that they are searching about is called himalayan salt. The two at the bottom, “pink salts” and “pink salt” are both short, simple and easy to remember, but they are not an option either due to their poor keyword scores. What Title Do You Have in Mind? Be sure to check its effectiveness as keywords. A tool like Jaaxy is indispensable to get the answer. If you are serious about monetizing your website, please consider getting a tool that you can trust, sooner than later. Start familiarizing yourself with keyword research. I highly recommend Jaaxy. It’s beginner friendly, and only $19/month, way affordable compared to many other keyword research tools out there. Also, it’s an online tool so you can use it from any mobile devices as long as you are connected to the internet. What phrases do you have in mind for your new website? Try them below at Jaaxy and see what score pops up. 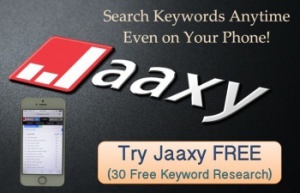 You can try the first 30 searches free at Jaaxy. STEP 4: Is DOT COM Domain Available? As I mentioned, matching site name and domain name is crucial for website promotion, so I always aim at fulfilling this goal. Also, I only go after Dot-com domains. You may be surprised that the majority of people are still with the assumption that dot com (.com) is all that is out there. To them, dot-org (.org) or dot-net (.net) or any other unfamiliar domain may appear untrustworthy. Don’t take the risk of losing a portion of traffic (visitors) to those people. Dot-com domains also tend to get ranked quicker and better in Google. If you are at all serious about building a successful business over the long term, then a dot-com domain for your website is crucial. I completed domain checking at Jaaxy for all the four keywords in a minute. Here is the result. They are all available for dot-com domain. The name of my new site has been decided. It is going to be “Pure Pink Salt” and the domain will be purepinksalt.com! Do I Need to Buy a Domain Name Now? A domain name is like a virtual real estate. Once you own it, you are in full control of that entity. Nobody else can own the domain that you own. You can sell it for profit one day if someone wants to buy it. And of course, you can build out an online business on the domain. A domain name is definitely necessary to purchase at some point in your online endeavor, regardless of your niche, if you are serious about success. But do you need to buy it at this moment? Well, it depends on how you want to proceed. From here, you have two possible paths to take. Do not buy the domain and create your website first on a sub-domain. Later on, you can buy your domain name and transfer the website you have built to that entity. I did purchase a domain name “purepinksalt.com” as I was worried that it will be gone soon. They say there are around 140,000 new websites created every single day! Meaning, domain names (especially the ones with dot-com) are being taken one after another and getting less and less. If you found a domain that you really like, I recommend getting a hold of it. After all, it costs less than $15 a year. Find a Good Name for Your Website! I hope this post helped you understand how to find a good name for a website. In the next post, we are finally going to proceed to the site builder. I will explain how I purchased my domain name using Jaaxy (Yes, you can do that too at Jaaxy. Now you see it’s worth $19) and then how I could launch my new website “Pure Pink Salt” in a few minutes. My new site is quite empty (at the time of writing this blog) but I am super excited! I will diligently work on developing it and share every aspect of my progress with you. 14 Comments on "A Good Name for a Website – How to Choose One"
Your post is so well written and super easy to follow. I really like how you’ve broken it all down, step by step – perfect for a beginner! Now that I read your post, I’m regretting the decision not to match my site name with my domain name. You are right, they should match. I should have put more thought into that at the time. I did get a .com domain, so I guess that was good! I’m glad you found the tutorial helpful 🙂 Matching the site name with domain makes the journey easy for beginners especially but if you already have a domain with .com, don’t worry too much and stick with it. It’s great that you possess a domain name with dot-com. Just be sure to target specific keywords in each blog you create and your website will start climbing up the ranking. Looking forward to hearing your success. Report back! 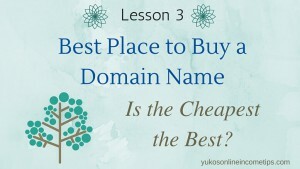 I think this is a great write up on how to choose a good name/domain for a site. The checkpoints you outlined here are great as well…even if you went off of those alone I’m sure you could come up with a solid name. Bookmarked this page for later use – Thanks for the write up! Jaaxy has been literally a life saver for my online business. I use it for everything: brainstorming, getting an idea for a new blog post, checking the keyword value of a new title, checking the current rankings for each page I created, etc. Do you already use Jaaxy? Then check out this video tutorial by Kyle. He uses the enterprise version of Jaaxy of course, but I only use the pro version and still could get lots from this video. I think it helps you as well! By the way, if you have any 404 pages on your site, be sure to chek this tutorial by our fellow WA member, PJ. It’s awesome! If I were a rookie to the whole learning of how to build a website and create a domain and all that good stuff, this page would have been the one I should stumble upon because you give all the details and info for someone who would need to get started. Very good! Glad you enjoyed the lesson. Yes, I started this tutorial to help those people who are just starting out. The early stage is the most confusing and overwhelming period in online business. I don’t want people to give up simply because they don’t know how to proceed. Let me know if there are any ways I can better this tutorial for newbies. I would also love to hear your success story! I couldn’t agree with you more. I didn’t have good advice on chosing a domain name. Right now I am thinking of changing it. I love your advice on chosing domain names, I’m going to use it to rename my site. How did you change yours? The process of changing my domain name itself wasn’t too bad as the tech team at Wealth Affiliate was super supportive. But I did consult with Kyle before I made my decision and asked what he thinks, like if my new domain name is worth changing from the old one. He told me his advaice and gave me all the instructions as to how I should go about it. If possible, I wouldn’t recommend changing your domain name. iff you really want to change it, I recommend you to consult with Kyle of your mentors at Wealthy Affiliate. Let me know if I could be any help with this. Thank you so much for this. Personally it took me almost 2 months just to think of a domain name. While marketers will tell you to get a website running they will not tell you very important steps like the article here. I think using Jaaxy is genius. I will be bookmarking this so I could come back when I’m ready for a new website. Me and the other newbies thank you !! It’s great that you didn’t rush things and took the time to think about a domain name! I am the one who rushed and had to re-do many things later. I should have been as thorough as you are from the beginning. I’m not going to make the same mistake with this new website, purepinksalt.com. As I am writing this reply to you, my new website still has only three pages (About Me, Private Policy and Home Page) and it is already on the 4th page on Google under the keyword “pure pink salt.” This alone tells me it is vital to select a site title (and domain name) carefully. Keep working Alex, and let me know if there is anything I can help you with. Good luck! Excellent instruction. I’m committed to my dot net domain now but I can certainly understand why a dot com is preferable. For my future sites, I’ll hold out for one. I never thought to base my domain name on a Jaaxy keyword search. I have some prospective niche domain names that I’ll put through that analysis before I purchase them. Thus far, the domain I chose purepinksalat.com through keyword search on Jaaxy is performing quite well, so I am glad I went for the low-hanging-fruit keyword for this new website of mine. A dot-net domain works fine as long as you keep providing values to your audience and succeed to brand yourself. That’s all that matters for your online success. Good luck with your online endeavor! Yuko, your site is amazing. There is so much information to read about. Hopefully not too much information. lol. You can definitely see the amount of time and research that you put into your site. It is very pleasing to the eye how you have the content on one side and your advertising on the other. Very nice site. I too will book mark your site. I personally feel that you will go far with your websites. Looking forward to the next one. Thank you for your kind comment! I am glad that you liked how my site is structured. My site has evolved over time. It definitely didn’t look like this on Day 1. I’m still striving to make it better and more user-friendly. If you have any suggestions to make it easier for you to navigate, please let me know. I appreciate your support!